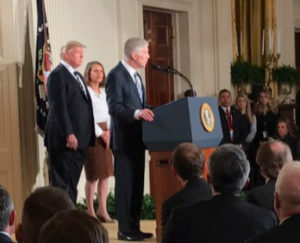 Reading through President Donald Trump’s Supreme Court Nominee Judge Neil Gorsuch’s decisions is a pleasure for those of us who love the Constitution and the rule of law. Here is a good example. Before the Supreme Court ever heard the Hobby Lobby case, Judge Gorsuch took a stab at it in his time at the U.S. Court of Appeals for the Tenth Circuit. If you remember, after ramming through the Affordable Care Act (ACA), aka Obamacare, with not a single Republican vote in support, using every dirty, political trick in the book (and even inventing new ones), the Obama Administration insisted in unnecessarily forcing Christian businesses to violate their conscience and pay for contraceptives and abortifacients, even if to do so would be against their deeply held religious beliefs. The Green family of Hobby Lobby and many other Christian businesses objected to this violation of their religious freedom and sued under the Religious Freedom Restoration act (RFRA). In the case of a constitutionalist, like Judge Gorsuch, the case was a simple one. And it was most certainly not about their personal religious views or policy preferences. Here is how he put it, concurring in judgment in favor of the Greens. Simple. Clear. Beautifully put. A judge that keeps his personal feelings about the issues of the day out of the judicial process and follows the law and the Constitution as written instead is a judge that can be impartial in the most important moments in our history when the nation is having particularly heated debates about the best policies the country should enact. That type of judge brings stability to the courts and makes our nation stronger by protecting our freedoms. It’s the type of judge Justice Scalia was, and we’re thrilled that he will be replaced by someone committed to the same principle.